Preheat the oven to 350 degrees and lightly grease a 9×13-inch, 3-quart baking dish with baking spray or olive oil. Place potatoes in a large microwave-safe bowl and add 1 cup water. Cover and microwave 5 to 7 minutes, or until the potatoes are just tender. Drain potatoes to paper towels and pat dry. Spread half on the bottom of the prepared baking dish. In a bowl, toss together the bell pepper, garlic and 1/2 cup of the gruyere cheese and spread mix over potatoes. In a separate bowl, beat together the eggs; whisk in half-and-half, yogurt, and another 1/2 cup gruyere cheese. Season with salt and pepper. Pour half of the egg mixture over the bell peppers and potatoes in the baking dish. Layer the remaining potato slices on top in overlapping rows. Pour the rest of the egg mixture over the potatoes, and top with the remaining 1/2 cup gruyere cheese. Bake uncovered 50-60 minutes or until the egg is puffed and golden around the edges and fully cooked in the center. Garnish with fresh parsley or basil. Let cool for 5 to 10 minutes before serving. Serves 6 to 8. Published on May 4, 2015 in Entrees, Food. What child doesn’t want to please his or her mother? I think it’s both instinctive and touching. Starting around first or second grade, I realized the best route to my Mama’s heart was to clean my bedroom (or a portion thereof) and then call her in. “Mama, I have a surprise for you!” She would then ooh and aah, tell me what a ‘good girl’ I was and give me a huge smile. I beamed with pride. Too bad I wasn’t quite as focused on my grades. The last thing I wanted to do in school — or at home, for that matter — was pay attention and study. A classic case of ADHD? Perhaps. But that was long before ADHD was even heard of. Since those early days, I’ve taken really good care of things I own, be it my car, home, clothes, etc. Almost to the point of perfection. Early in our marriage, most Friday nights I spent vacuuming and dusting. Russell never complained and even helped me sometimes. He had the same compulsion about cleaning his golf clubs. We’ve both improved in that regard. Now, fast forward 30-plus years. I still like my house clean, but I’ve wised up. Paraphrasing: I kick large dust bunnies under the sofa, and after sweeping the kitchen, well, what’s a little sand and grime swept under the fridge? Why not wait and clean it all at once, years down the road? And that self-cleaning oven, well — that’s a joke. In seven years, it’s never once cleaned itself and that’s the very reason I bought it. Honestly! False advertising! But where I allow myself to be a full-fledged Messy Mary is in my easy chair that’s next to my Grandmother Julia Margaret’s marble-topped table. On top of that table is my favorite wicker tray, which holds an assortment of items I use daily. One favorite is my hand-painted glass with the FROU (Females Rule Our Universe) lady that holds my pens. There’s also a ruler, yellow highlighter, receipts I need to enter for various purchases, emails I need to take action on, a newspaper section that tells us what’s happening today, sticky notes with ideas and phone numbers, a calculator and well, you get the idea. To the average person, my work place might look messy, but so what? It’s my house and if Mama’s happy, ain’t everybody supposed to be happy? Even Russell has mellowed over the years. All I have to do is throw him a pork chop now and then and he’s happy, too. But back to Mom: I get a huge grin from her these days by simply showing up for a visit at her assisted living facility. She hugs me tightly, tears up a little and says, “Ann, I am so glad to see you.” And that’s the purest form of love. Published on May 4, 2015 in Southern Hospitality and tagged none by Kristy Johnson. If you can’t make it to Churchill Downs for the Kentucky Derby Saturday, May 2, then the next-best place to be is the Legends Club for the annual Derby Day party. 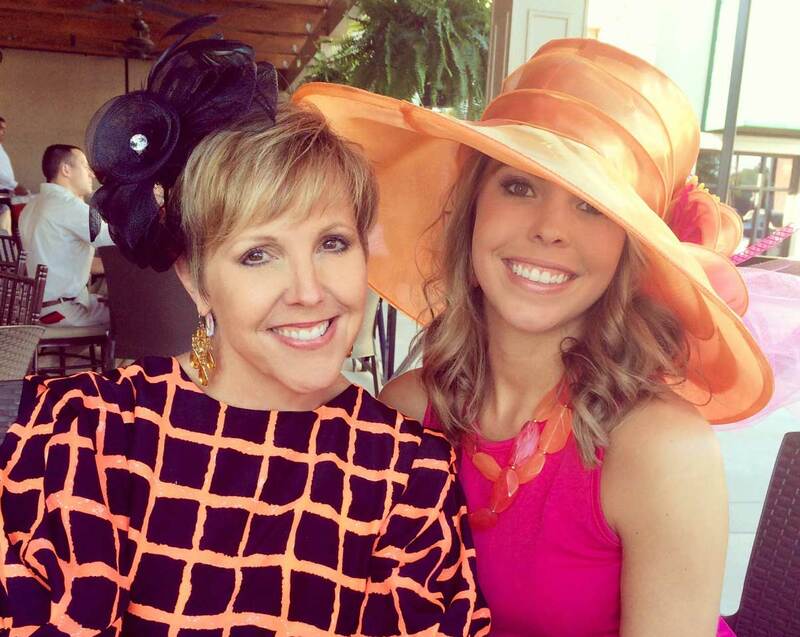 Horse racing fans or people who just like to have fun can cheer on their favorite horses like they’re at Louisville’s famous racetrack. Partygoers can nibble on Southern cuisine and sip – what else? 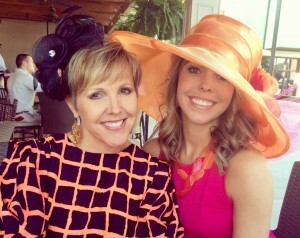 – mint juleps while they watch a live broadcast of the Run for the Roses on giant TV screens. The event also features live music, outdoor games, raffles, equestrian fanfare, a ladies hat contest and a gentlemen’s fashion contest. A silent auction also will feature artwork by employees of Augusta Training Shop. Proceeds from the event will benefit Augusta Training Shop, a nonprofit that was established in 1947. The organization employs mentally and physically challenged adults who have been taught to repair, strip and refinish furniture; re-cane chairs and polish metals. How Much: $75 in advance at any Georgia Bank & Trust location; online at AugustaTrainingShop.com or by calling (706) 738-1358; $100 at the door. Price includes all food and beverages. Published on May 4, 2015 in LIFE + STYLE and tagged front by Kristy Johnson. The Mustang marked 50 years of continuous production in April 2014, and soon Mustang fans will have something else to celebrate. Each year the Mustang Club of America holds four national shows, and this month one of them – the Gateway Southern Stampede – is coming to Columbia County. Car show entrants will vie for trophies and pride when judges evaluate Mustang models in categories ranging from modern to vintage, Shelby to Boss, racing to cruising. Southern Stampede patrons will have plenty to do besides admire cars, however. A number of vendors will set up at the event, and they should appeal to a broad range of people. In addition to booths with automobile-related products, others will offer goods such as Tupperware, cosmetics and jewelry. A Saturday Night Banquet, which is open to the community, will feature a Sconyers barbecue dinner and entertainment by comedian Jeff Allen. Blackstock, who currently owns a 2007 Shelby and a 2015 Mustang convertible, says their durability is one of the features that make the model so popular. “That was one of my first cars when I was in high school, and it lasted throughout,” he says. Proceeds from the event will benefit the Rebecca Erryn Moon Foundation, a nonprofit organization in Martinez that supports children who have cancer and their families. 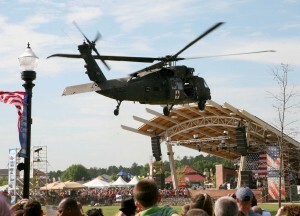 The area once again will celebrate Armed Forces Day with a salute to our nation’s soldiers at Thunder Over Augusta. Entertainment at the event, which is returning after a one-year absence, will include freestyle motocross motorcycle stunt shows by Team FMX, a Huey helicopter that people can ride for a fee, military displays of vehicles and equipment from Fort Gordon and musical performances. The North American Lumberjack Games will be a new addition to Thunder Over Augusta this year. Festivalgoers can watch competitors participate in contests such as log rolling, ax throwing and sawing during three different shows. Food and drink vendors will be on hand, and a kids’ zone will offer fun and games to the younger set. Thunder Over Augusta will conclude with a fireworks display. 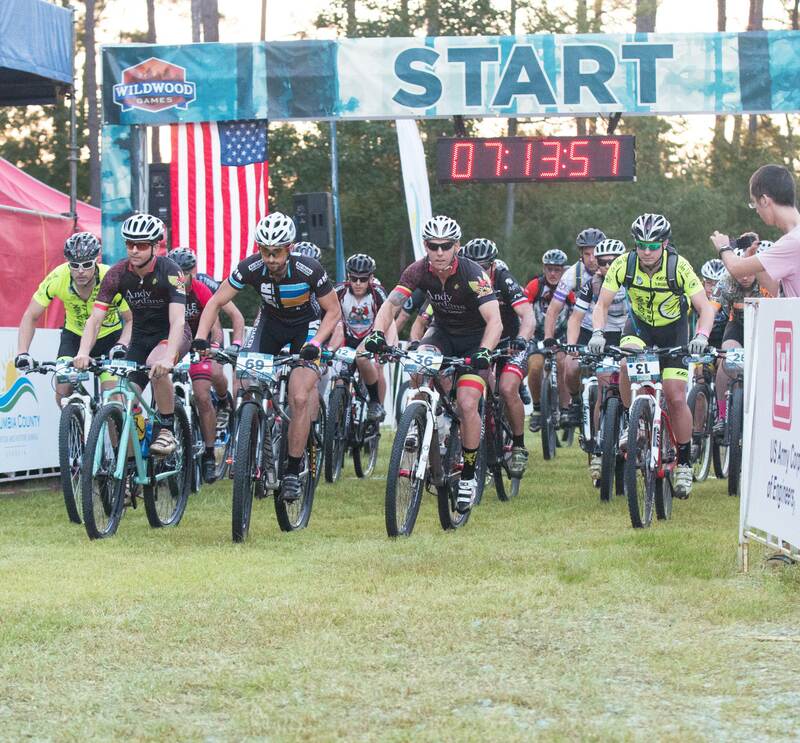 Almost 1,000 athletes could test Columbia County’s trails and waters as cyclists, open-water swimmers and runners compete at the Wildwood Games Presented by Zaxby’s Saturday, May 2 and Sunday, May 3 at Wildwood Park. 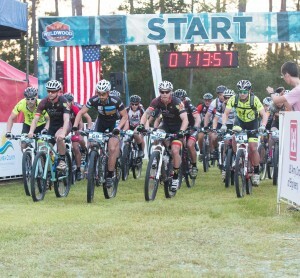 On Saturday the USA Cycling Marathon Mountain Bike National Championships will be held in Columbia County for the first time as the nation’s top endurance racers ride in pursuit of the stars-and-stripes jersey. The event also includes open-water swims of 1.5 miles or 3 miles on Saturday and 50K, marathon, half-marathon and 10K trail runs on Sunday. A two-day, 54-hole disc golf tournament and an expo will be part of the festivities as well. “Our goal is for this to be a premier sports festival in the Southeast, and ultimately, in the country,” says Randy DuTeau, the Columbia County Convention and Visitors Bureau executive director. Last summer’s inaugural Wildwood Games served as a test run for the mountain bike championships. According to DuTeau, this year’s Games will include challenging, well laid-out and well-marked courses for the racers. Well-trained volunteers and an emergency management team that is ready to respond to any situation will be on hand as well. The expo will include food, beverages and vendors that sell products such as health foods and equipment for the outdoor-oriented types of activities that are part of the Games. Hours are 10 a.m. – 6 p.m. Saturday and 8 a.m. – 2 p.m. Sunday. “Folks will want to come out and watch the races, and we hope they’ll stick around for the awards presentation,” DuTeau says. For more information, visit wildwoodgames.com.